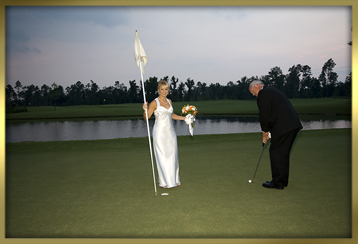 Whether you are planning a large outdoor wedding, or a small, intimate ceremony, The Preserve Golf Club provides the ideal setting for your special occasion. Envision your picture perfect wedding ceremony and reception at the Clubhouse. The magnificent views of the 18th green coupled with the view of the lake, create a picturesque backdrop for memorable photographs. The sprawling view of the majestic golf course is ideal for outdoor weddings for up to 250 guests or up to 80 seated guests inside the Clubhouse. The elegant, private ambiance of The Preserve offers a unique location, providing the wedding couple and their guests the exclusivity and privacy they desire. The Preserve offers an elegant and serene setting, perfect for hosting any type of special event, including rehearsal dinners, parties, meetings, banquets, and corporate events. Our Food & Beverage staff excels at creating expertly prepared, sumptuous, menus of hors d’oeuvres, lunch and dinner buffets and plated meals. Corporate meetings, seminars and workshops are easily accommodated in the golf course’s Conference Room which provides audio visual and sound equipment including a microphone system and retractable 32” flat screen TV. The Conference Room can accommodate up to 22 seated. Our staff is dedicated to working with you to assure your special event exceeds your expectations. Please complete our Request Form to receive more information.